Firefighters work near the rose window of Notre Dame cathedral, Apr. 16, 2019 in Paris. The fire swiftly ripped through the cathedral's timbered roof supports, where workmen had been carrying out extensive renovations to the spire's wooden frame. The Paris prosecutor has opened an investigation into "involuntary destruction by fire." Police on Tuesday began questioning the workers involved in the restoration, the prosecutor's office said. "Yesterday we thought the whole cathedral would collapse. Yet this morning she is still standing, valiant, despite everything. It is a sign of hope," said Sister Marie Aimee, a nun who had hurried to a nearby church to pray as the fire spread. Pope Francis, the leader of the Catholic Church, was praying for those affected, the Vatican said, adding: "Notre-Dame will always remain - and we have seen this in these hours — a place where believers and non-believers can come together in the most dramatic moments of French history." Britain's Queen Elizabeth expressed deep sadness while her son and heir Prince Charles said he was "utterly heartbroken." 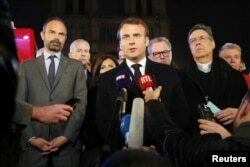 French President Emmanuel Macron speaks as Prime Minister Edouard Philippe and Archbishop of Paris, Michel Aupetit, stand near the Notre Dame Cathedral, France, Apr. 15, 2019. The rival billionaire owners of France's two biggest luxury fashion empires, Francois-Henri Pinault of Kering and Bernard Arnault of LVMH, pledged 100 million euros and 200 million euros to the restoration respectively. Oil company Total pledged 100 million. The city of Paris said it would provide 50 million. The company carrying out the renovation works when the blaze broke out said it would cooperate fully with the investigation "All I can tell you is that at the moment the fire began none of my employees were on the site. We respected all procedures," Julien Le Bras, a representative of family firm Le Bras Freres. 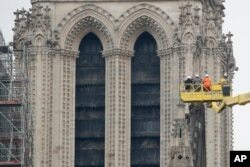 A crane lifts experts as they inspect the damaged Notre Dame cathedral after the fire in Paris, Apr. 16, 2019. "Notre-Dame was our sister, it is so sad, we are all mourning," said Parisian Olivier Lebib. "I have lived with her for 40 years. Thank God that the stone structure has withstood the fire."